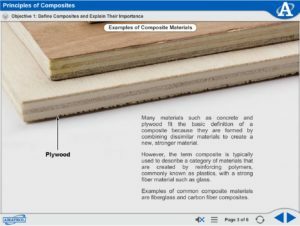 Composites are materials made up of two or more components, called constituent materials, which have significantly different physical or chemical properties. 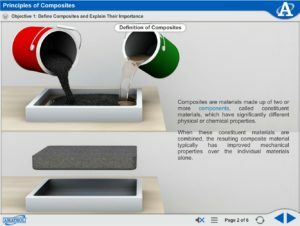 When these constituent materials are combined, the resulting composite material typically has improved mechanical properties over the individual materials alone. 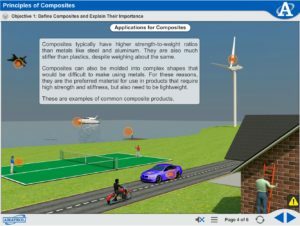 Amatrol’s unmatched multimedia utilizes text, audio, and stunning 3D animations that engage learners in theoretical knowledge and concepts. This thorough, exceptionally detailed curriculum is built to begin with the basics and steadily advance to more complex concepts. Through partnerships with key industry leaders and leading edge educators, Amatrol developed the right balance of knowledge needed to train learners to work in their chosen field.